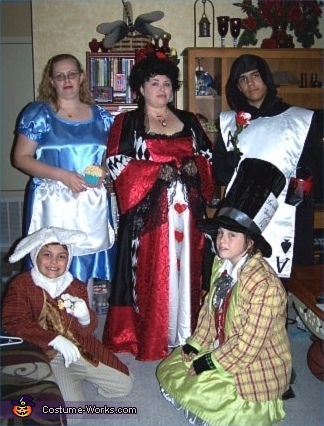 From top left is daughter Amber as Alice. Mom, Mary, as the Queen of Hearts. Friend, Alex, as the Ace of Spades. Bottom left is Alex's brother, Jordan, as The White Rabbit. Marys other daughter, Jillian, as The Mad Hatter. A big THANK YOU to Mary in Florida for this entry! This homemade costume for groups entered our 2007 Halloween Costume Contest.